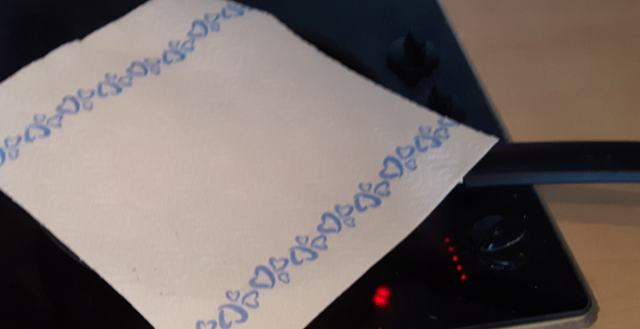 This seems like a very convenient solution, since you can just throw away the paper towel afterwards, as opposed to conventional splatter shields, which are a nuisance to clean. This definitely falls into the category of an accident waiting to happen. No flammable materials should ever be used in this manner. Not only is there the danger of the paper catching fire from a heating element or flame, there is also the risk of it catching fire from a pan fire (and consequently making that situation worse). However, if you want something disposable, a foil sheet works and won't catch fire. Additionally, if you want it vented so steam can escape, you can poke small holes in the foil. I can't see what kind of heater this is. If it is induction, there is no problem. You can even keep the paper between heater and pan. It can char a bit there, but unless you are keeping your pan very hot, it works well and won't catch fire. On top of the pan, it is even safer. If this is a resistive stove, then it is a bad idea. The grease soaked paper might touch the burner like Chris Bergin said, and catch fire. Had it been gas, it would have been even worse. I recommend you use the lid instead. I think is way better and safer to use it instead of some paper. The only way to use a paper towel safely could be on an induction oven, but i still consider better to use a lid, maybe shifting it a little if you want to avoid completely closing the pan. I use razor sharp Japanese knives. Most people that I cook for, or that watch me cook, comment on how those can't be safe. I made the switch over 10 years ago, and so far, I still have all my digits. I have shaved some skin off my knuckles (yum! ), but I haven't made it through enough flesh to seriously bleed or hit bone (yet). And for larger dinners with friends I will drink - a lot - when I cook. Yay me! Still, I think this practice is perfectly safe for me. Just as I find frying with oil in large, open cast iron skillets to be perfectly safe for me. 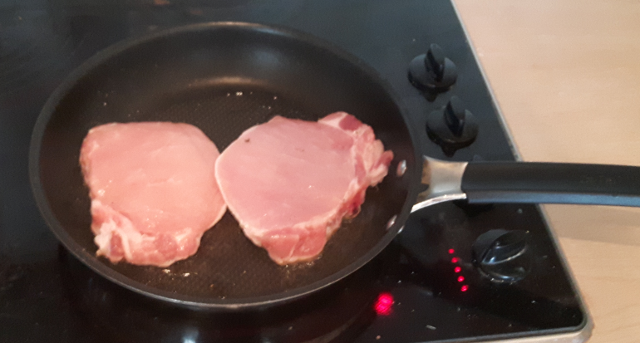 So with that said, I recently (in the past year or so) have started using this method of covering a skillet with paper towel while I fry bacon. I don't get the pan hot enough for the paper to combust, and I typically use a high-wall 10" or 12" skillet, which keeps the paper well away from the burner's flame. Using a Standard Lid. Way, way too much steam buildup, which brings water into the pan of grease for a very unhappy tim (even if the lid is left "cracked" on the pan to allow most the steam to escape). Using a Mesh Splatter Guard. These work ok, but have two main drawbacks: 1) if you don't own several sizes to match your pan sizes, they can be cumbersome; and 2) they are more of a pain to clean (especially when compared to just throwing away a paper towel). Microwaving Bacon. It comes out ok, but it's just not the same. I get such a better crunch and variance in consistency when frying bacon (especially in cast iron). Not Eating Bacon. This is just not an option. I love combining paper with fire when making a campfire or lighting a fireplace but highly do not recommend using paper as a 'lid' or Splatter Guard when cooking. Besides possibly catching fire, the paper towel could also become 'steam-soaked' and sink into the food being fried. Removing a hot oil-soaked paper towel would not be 'finger friendly' and could also drip onto a heating element or into a gas flame. Because I have several frying pans that don't have lids, I simply tear off a sheet of Aluminum Foil that's large enough to lay fully over the pan...but leaving one or two side edges lifted a little higher so steam can escape without burning you or adding water to the oil. This has worked well for me when frying up bacon and eggs, chicken, seafood, French fries, onion rings, etc.